In February, we found out that Google intends to test video ads next to search results and now we can finally see some examples. 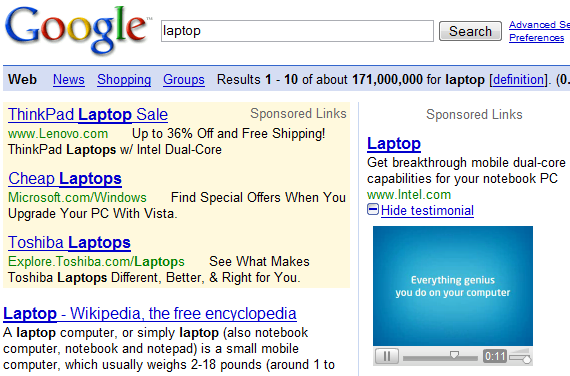 Digital Inspiration spotted an AT&T ad targeted to the query [phone], but there's also an Intel ad when you search for [laptop]. Google uses plusboxes to show that there's a video ad that complements the text and labels them with messages like: "watch commercial", "watch demonstration", "watch testimonial". The video ad is triggered only after you click on the message and it's a small 160x140 video that uses the Google Video player. The ads are very short (around 30 seconds) and they end by displaying a clickable URL to the landing page. Google uses the same visual elements as for the search results and user are already used to previewing YouTube videos by clicking on the small plus sign bellow the snippets. 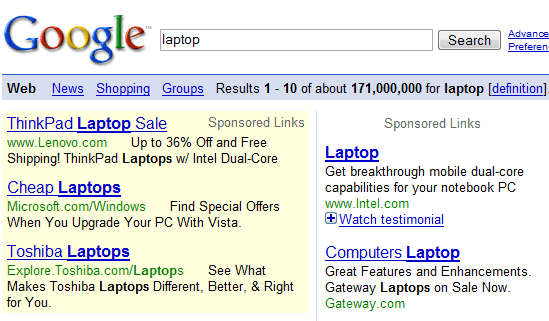 Unlike the video search results, Google doesn't include thumbnails next to video ads, but this may change in the future. Overall, the video ads from Google's search results aren't annoying, they must be explicitly selected and they offer more details that couldn't be included in the short text ad. The only problem that I have with video adds is that they are boring, in my mind, marketing has to grab the client within 10 seconds or it fails, just a thought! Good move by Google...text adds r boaring. VideoAds are the future but many Advertisers do not have the possibilities to create VideoAds. I think Video Ads are an obvious change and an integral one in the market. If we look at who is searching on the internet and what is really relevant to people it is obvious Video will play an implemental role in this. Obvious and genius move by google. That's why I bought their stock which by the way will go over 1,000 mark my words! Here is the major thing with all of this. Videos can have text, audio, visual, full stimulation of most of the senses. Words are words and I believe I saw a quote back in the day a picture is worth a 1000 words well in my opinion a Video is worth a Million! I think that video ads are an inevitable progression for google. From a personal viewpoint I do also find them distracting and with so much advertising over everything these days they will put quite a few backs up. I think it is still the way to go though. I'm not a fan of video adverts, it will make browsing the net more frustrating - definitely don't entice me. I think video adds are the way forward. It's only a matter of time before everything goes video. Surely it'll only work if you've got your sound turned on? It will only work if you like watching videos. The recent news from Youtube investing millions into creating content channels indicates that revenue generation through Youtube adverts isn't as productive for clients as first thought. Hence the need for compelling content. Video adverts certainly haven't been the contsant source of revenues for publishers that they were projected to be when this post was first written!